individuality while creating a usable and welcoming environment. because of their durability, beauty and usability. The vast style selections provide you with options that are perfect for your unique space. For over 16 years, Oldcastle has provided homeowners with a versatile selection of paving stones and retaining wall materials. The quality craftsmanship and cutting-edge designs make this product line the ultimate choice for bold, distinctive, unforgettable hardscapes. Belgard offers a large variety of classic, contemporary or antiqued designs, which means you can easily create the yard of your dreams. When it comes to choosing the best, Oldcastle Belgard paving stones are essentially the only option. No other manufacturer of stones can compete with the successful history of Belgard. Their pavers capture the authentic look and feel of natural stone, but they are more durable and easier to maintain. Regardless of the application, the Belgard collection will enhance any exterior landscape. Belgard produces pavers that can be used for a variety of projects. No matter how big or small the task, you will find the perfect pieces to enrich your outdoor space. You may want to improve the look of your driveway, walkway, pool deck, or patio with classic interlocking stones, or you may desire the ambiance created by a garden wall, outdoor kitchen, fire pit or fireplace. Regardless of the application, Oldcastle Belgard pavers and outdoor living products will strengthen the visual appeal and practicality of any yard. You can create a private, romantic retreat by adding a cozy hearth, or you can design your own party zone by constructing a spacious and impressive terrace. The options are endless when you elect to use the most superior products on the market. The staff at Oldcastle Belgard is devoted to providing original solutions to long-standing problems. No matter what type of challenge you encounter in your yard, the products available to you will get you started on creating a breathtaking landscape. Choosing the right materials for your exterior makeover is the first step in designing a masterpiece. Once you have your building blocks, everything else will fall into place perfectly. Belgard selects only top-quality products for hardscaping. This means your stones will last for years. These durable pavers can withstand various temperature changes and endure a considerable amount of foot and vehicular traffic. Each finished product is tested for stability and consistency. These tests reflect the manufacturer’s desire to continually improve and upgrade the products. There are countless advantages to using these superb stones for your outdoor projects. With the wide range of options available, you will easily find a style to complement your existing landscape. In addition to being visually appealing, these stones are virtually maintenance-free. Creating a comfortable, beautiful, usable outdoor living space is easy and affordable. The color selections in Belgard pavers is also unsurpassed. The use of soft, blended, natural tones mimics the colors found in nature. In addition, Belgard is one step ahead of the competition in regards to design and style. They are on the cutting edge, always developing new products, and improving upon their older versions. Belgard outshines its competitors by combining sturdiness, longevity, performance, innovation and natural beauty in one product. With little effort, you can find a paver perfectly matched to your home’s aesthetic. With so many choices available to you, designing the ideal yard can be overwhelming. Whether you want to add a pool deck, install a raised patio, or create the perfect garden retreat, it’s best to choose stones that harmonize with the rest of your yard. You can assemble wall systems to add definition to a flat landscape, enclose entertainment areas with sitting walls, or build a convenient walkway to your garden. Once you meet your practical needs, consider the overall look of your yard. Use multiple textures to capture interest, and install earthy, organic paving stones to optimize what nature already has to offer. Your yard should reflect who you are and what you enjoy. If you are thoroughly modern, consider the smooth, clean cuts of classic pavers. If you adore the rugged outdoors, choose roughly hewn antique stones. 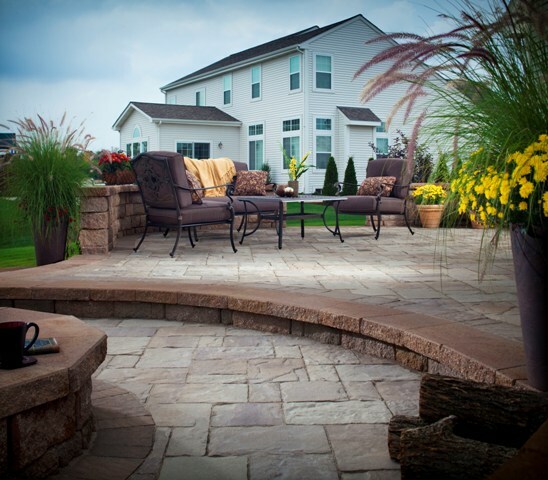 Oldcastle Belgard stone pavers, walls and outdoor living products will drastically improve the look of your landscape. With a large selection of innovative shapes, colors and textures, these superior products suit any style. Install It Direct can provide you with more details on the advantages of using Belgard products. Contact us today, and discover a whole new world of outdoor luxury. What To Do With Your AC Unit When Installing A New Paver Patio or Walkway?